There are three main fears that prevent Christians from sharing the Gospel with others, according to a church planter. The first is not knowing what to say, Barry York, president of Reformed Presbyterian Theological Seminary, wrote on the Gentle Reformation blog. He said that evangelism should not be overcomplicated, however, and should focus on the central messages, such as God sending his only Son to die for mankind’s sins. “In evangelism, God has given us the message we need to share with unbelievers. The whole Bible tells the story of creation, mankind’s fall into sin, and the provision of a Savior through Jesus Christ. But the Scriptures do not only give the words necessary for unbelievers to know the content of the gospel. The Bible also gives the words necessary to encourage Christians to evangelize, especially when it comes to overcoming fears." The next big fear he identified is the fear of feeling alone and powerless. “This fear is healthy to have, for it is reminding you that you must rely on the Holy Spirit in evangelism. The Great Commission to disciple the nations ends with this promise: “Behold, I am with you always, even to the end of the age.” Through His Spirit, Jesus is with you wherever you go,” York said. Finally, he said that people fear being mocked or upsetting others. “Rejection, ridicule, and anger come with the territory in evangelism. Yet we know we are told not to fear even the most violent of reactions against the gospel. Matthew 10:28 says, ‘Do not fear those who kill the body but are unable to kill the soul; but rather fear Him who is able to destroy both soul and body in Hell,’” he pointed out. Believers should be excited about telling others of Jesus “and His victory over sin and death” and not fear their reaction, he emphasized. “So here’s the question for you. What fear is keeping you from telling others about Jesus?” he asked. Greg Stier, founder and president of Dare 2 Share Ministries International, trains youth to share their faith with others. He also argued that fear holds a lot of Christians back. “Sharing your faith is a scary prospect. You can lose face and friends as a result of communicating this ‘narrow-minded’ message of the Gospel even when you do so in love. When choosing between being accepted by others and sharing the good news with others too often Christians choose silence. 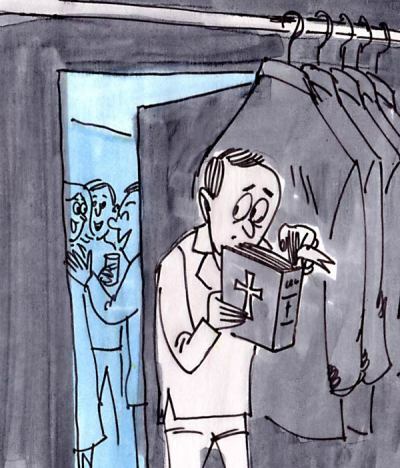 Fear is the biggest culprit that keeps most Christians from evangelizing,” Stier said earlier. “The Cure: ‘Pray also for me, that whenever I speak, words may be given me so that I will fearlessly make known the mystery of the gospel, for which I am an ambassador in chains. Pray that I may declare it fearlessly, as I should.’ Ephesians 6:19-20,” he advised.